Yay, more lighting! This is part of a collab with some VI's from the to vector the Adventures in the Crystal Empire DVD cover (which is set to be released on December 4!!). Unfortunately, the back half of rarity is cut off in the released cover image, so I had to take a wild guess at Rarity's tail (which is pretty much guaranteed to be different in the show ). I hope it still came out fabulously! Huge thanks to and for help with the perspective on the cutie mark!! If you do use this (or any of my other artwork), please let me know so I can check out what you make with it! kk going to submit it. I read the title in song. title is freaking long and inappropriate to the picture. i'd say "Crystal pony Rarity". Glad you like the vector! You know I kinda see this as a hairstyle Rarity would have when she's older. it's incredible how you can make Rarity look even more fabuolus than she uses to be! Rarity looks really pretty as a Crystal Pony. 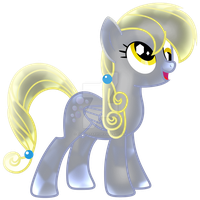 I love the design used for her mane, it looks much more stylish than what they usually do when they do up-do mane styles. I'm not using the vector, rather using it as a reference, the mane and tail design is great. I'm doing a picture for a OC going to the gala with rarity. A little scrap book page of the two going to the gala. Would you like me to link it to you when its done? Sure thing, that would be awesome!! So thats what they meant for the crystally looks. Where'd her eye shadow go? As others have already told you... You made the body too... concave. Also the heptagonal brights, but I guess that's up to you. Haha, yeah... I'm definitely still working on learning correct pony anatomy so I did unfortunately make Rarity a little long (and her flank is waaay up in the air ) Hopefully I'm getting better in my more recent vectors, and hopefully I'll keep improving And yeah, the only reason I didn't make the eye shine's heptagonal was because Rarity's were circular in the DVD cover (and it was going to be part of a collab that never really got off the ground)... but maybe when season 3 comes out I'll release a new version with the right eye shines. Thanks for the feedback!! Cud My ohder channel use it? Trivia: Applejack is my favorite pony and she has a HEPTAGONAL larger eye reflection. She isn't hypnotized with crystal eyes SHE CAN ONLY SAVE US! OMG Rarity is so pretty in this way! To Tartarus with history! It is fabulosity that shall save the crystal ponies! Bestest Crystal Pony I've seen yet!